What does this mean for Blockchain scalability? So what are the solutions to the Blockchain scalability issues? How does this help in Blockchain scalability. 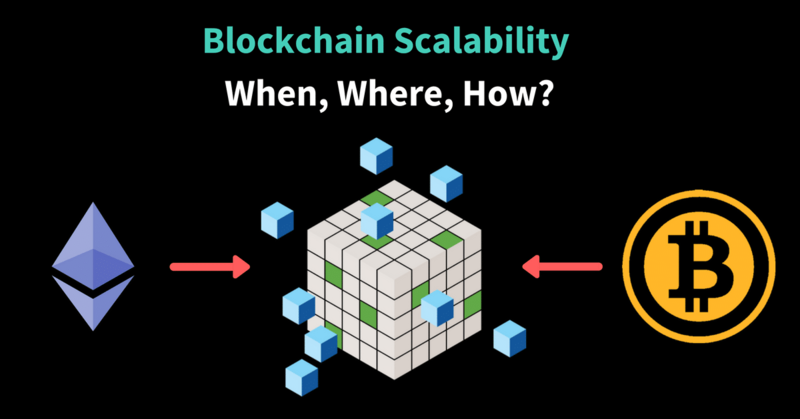 Blockchain Scalability, a very real problem! Now, this may look very impressive, but here is the thing, the initial design of cryptocurrencies was not meant for widespread use and adaptation. While it was manageable when the number of transactions was less, as they have gotten more popular a host of issues have come up. The time is taken to put a transaction in the block. The time is taken to reach a consensus. In bitcoin and ethereum, a transaction goes through when a miner puts the transaction data in the blocks that they have mined. So suppose Alice wants to send 4 BTC to Bob, she will send this transaction data to the miners, the miner will then put it in their block and the transaction will be deemed complete. However, as bitcoin becomes more and more popular, this becomes more time-consuming. Plus, there is also the small matter of transactions fees. You see, when miners mine a block, they become temporary dictators of that block. If you want your transactions to go through, you will have to pay a toll to the miner in charge. This “toll” is called transaction fees. 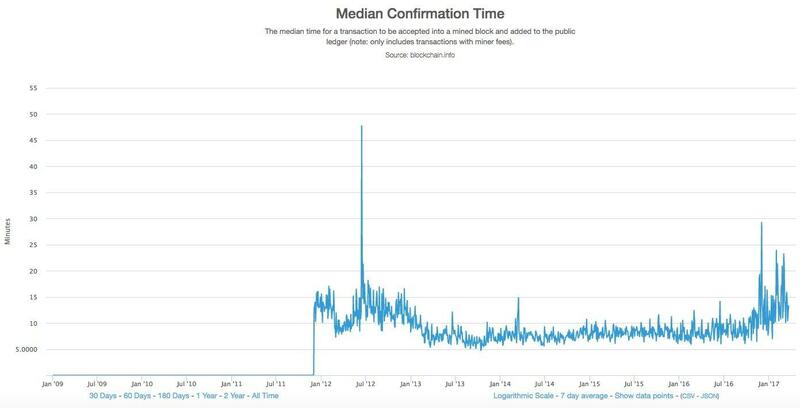 More often than not, the transactions had to wait until a new block was mined (which is 10 mins in bitcoin), because the older blocks would fill up with transactions. Bitcoin has a size limit of 1 mb (this will be expanded on later) which severely limits its transaction carrying capacity. To understand what “gas” means, think of this situation. Alice has issued a smart contract for Bob. Bob sees that the elements in the contract will cost X amount of gas. Gas meaning the amount of computational effort on Bob’s part. Accordingly, he will charge Alice for the amount of Gas he used up. Once again, a number of transactions going through is limited. Currently, all blockchain based currencies are structured as a peer-to-peer network. The participants, aka the nodes, are not given any extra special privileges. The idea is to create an egalitarian network. There is no central authority and nor is there any hierarchy. It is a flat topology. All decentralized cryptocurrencies are structured like this because of a simple reason, to stay true to their philosophy. The idea is to have a currency system, where everyone is treated as an equal and there is no governing body, which can determine the value of the currency based on a whim. This is true for both bitcoin and Ethereum. Now, if there is no central entity, how would everyone in the system get to know that a certain transaction has happened? The network follows the gossip protocol. Think of how gossip spreads. Suppose Alice sent 3 ETH to Bob. The nodes nearest to her will get to know of this, and then they will tell the nodes closest to them, and then they will tell their neighbors, and this will keep on spreading out until everyone knows. Nodes are basically your nosy, annoying relatives. Remember, the nodes follow a trustless system. What this means is, just because node A says that a transaction is valid doesn’t mean that node B will believe it to be so. Node B will do their own set of calculations to see whether the transaction is actually valid or not. This means, that every node must have their own copy of the blockchain to help them do so. As you can imagine, this makes the whole process very slow. The problem is, that unlike other pieces of technology, the more the number of nodes increases in a cryptocurrency network, the slower the whole process becomes. Consensus happens in a linear manner, meaning, suppose there are 3 nodes A, B and C.
However, if there is a new node in the system called “D”, that would add one more node to the consensus system, which will increase the overall time period. As cryptocurrencies has become more popular, the transaction times have gotten slower. This is especially a problem with Ethereum, because it has the most number of nodes among all cryptocurrencies. Thanks to the ICO craze, everyone wants to have a piece of Ethereum, which has significantly increased the number of nodes in its network. In fact, as of May 2017, Ethereum had 25,000 nodes as compared to Bitcoin’s 7000!! That’s more than 3 times. 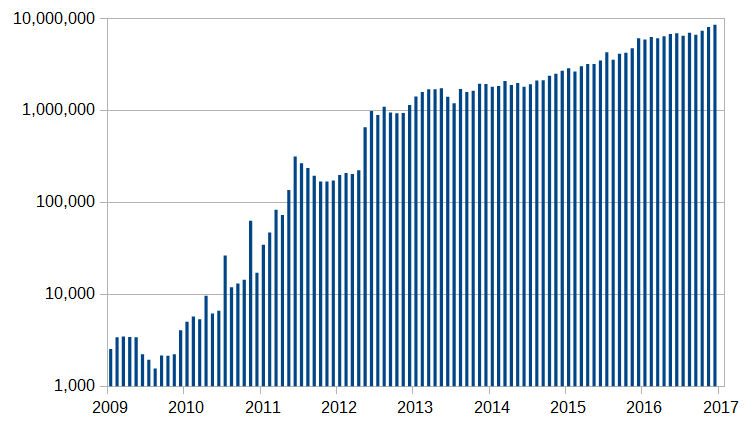 In fact, the number of nodes from April to May increase by 81%…that’s nearly double! Both Ethereum and Bitcoins have come up with a host of solutions which have either already been or are going to be implemented. Let’s go through some of the major ones. Blockstream’s Dr Peter Wiulle envisioned Segwit as one of the features of the sidechain which will run parallel to the main bitcoin blockchain. See the input data? Alice is only using one input transaction as vin_sz is 1. The input data is 0.0015770 BTC. This is the anatomy of a simple transaction. 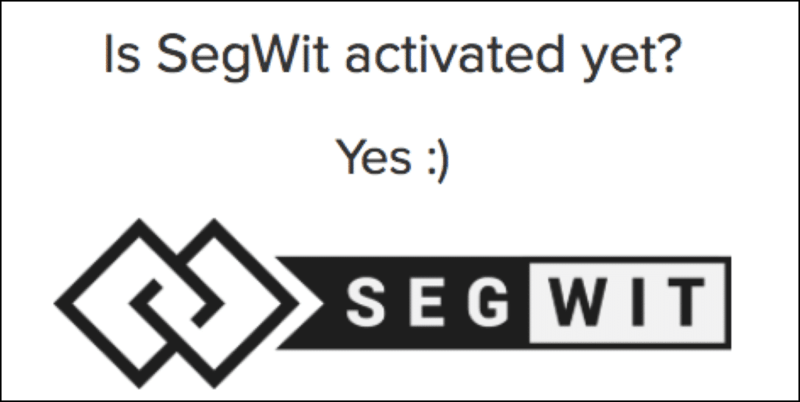 So what will happen on activating Segwit? The problem with this signature data is that it is very bulky. In fact, 65% of the data taken up by the transaction is because of the signature. And this data is useful only for the initial verification process, it is not needed later on at all. What this will do is that it’ll free up a lot of space in the block itself for more transactions. It was envisioned that the signature data would be arranged in the form of a Merkle tree in the side chain. The Merkle root of the transactions was placed in the block along with the coinbase transaction (the first transaction in each block which basically signifies the block reward). However, on doing this, the developers stumbled upon something unexpected. They discovered that on putting the merkle root in that particular place they somehow increased the overall block size limit WITHOUT increasing the block size limit! Basically, doubling the amount of transactions in a block will double a number of transactions and that in turn will double the amount of signature data that will be inside each of those transactions. This would make the transactions even more bulky and increase the transaction time by a huge amount. This opens the gates for malicious parties who may want to spam the blockchain. Now, since the main problem of bitcoin and ethereum has been the limited blocksize, why don’t we just increase them? Bitcoin wasn’t supposed to have a 1 MB limit but then Satoshi was forced to put it because they didn’t want Bitcoin to be bogged down by spam transactions. Miners will lose incentive because transaction fees will decrease: Since the block sizes will increase transactions will be easily inserted, which will significantly lower the transaction fees. There are fears that this may deincentivize the miners and they may move on to greener pastures. If the number of miners decrease then this will decrease the overall hashrate of bitcoin. Bitcoins shouldn’t be used for everyday purposes: Some members of the community don’t want bitcoin to be used for regular everyday transactions. These people feel that bitcoins have a higher purpose than just being regular everyday currency. It will split the community: A block size increase will inevitably cause a fork in the system which will make two parallel bitcoins and hence split the community in the process. This may destroy the harmony in the community. It will cause increased centralization: Since the network size will increase, the amount of processing power required to mine will increase as well. This will take out all the small mining pools and give mining powers exclusively to the large scale pools. This will in turn increase centralization which goes against the very essence of bitcoins. Block size increase actually works to the miner’s benefit: Increased block size will mean increase transactions per block which will in turn increase the amount of transaction fees that a miner may make from mining a block. Bitcoin needs to grow more and be more accessible for the “common man”. If the block size doesn’t change then there is a very real possibility that the transactions fees will go higher and higher. When that happens, the common man will never be able to use it and it will be used exclusively only by the rich and big corporations. That has never been the purpose of bitcoin. The changes won’t happen all at once, they will gradually happen over time. The biggest fear that people have when it comes to the block size change is that too many things are going to be affected at the same time and that will cause major disruption. However, people who are “pro block size increase” think that that’s an unfounded fear as most of the changes will be dealt with over a period of time. There is a lot of support for block size increase already and people who don’t get with the times may get left behind. Segwit is not a permanent fix. 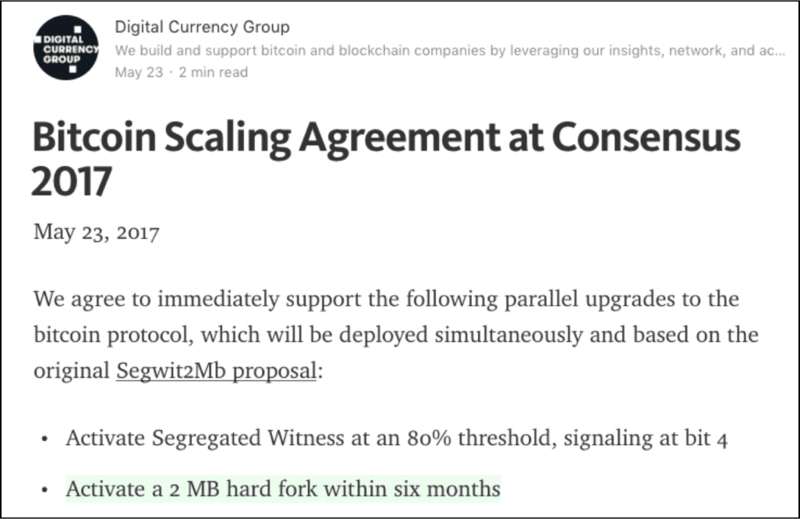 Anyway, on May 21 2017, the New York Agreement took place where it was decided that Segwit will be activated and the block sizes will increase to 2 mb. People who were not happy with the idea of Segwit activating forked away from the main chain and made Bitcoin Cash which has a block size limit of 8 mb. Firstly, the main thing that is hindering Ethereum’s scalability is the speed of consensus among nodes. Increasing the block size will still not solve this problem. In fact, as the number of transactions per block increases, the number of calculations and verifications per node will increase as well. One of biggest things happening right now is Ethereum’s shift from proof of work to proof of stake. Proof of stake: This protocol will make the entire mining process virtual. In this system we have validators instead of miners. The way it works is that as a validator, you will first have to lock up some of your ether as stake. After doing that you will then start validating blocks which basically means that if you see any blocks that you think can be appended to the blockchain, you can validate it by placing a bet on it. When and if, the block gets appended, you will get a reward proportional to the stake you have invested. If, however, you bet on the wrong or the malicious block, the stake that you have invested will be taken away from you. To implement “proof of stake” Ethereum is going to use the Casper consensus algorithm. 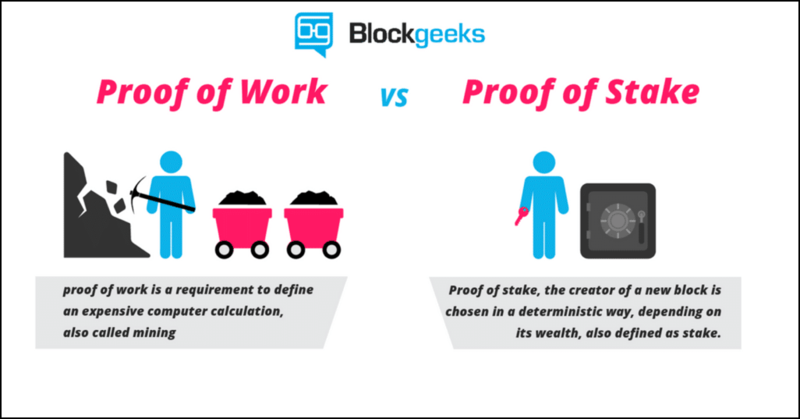 In the beginning it is going to be a hybrid style system where majority of the transactions will still be done the proof of work style while every 100th transaction is going to be proof of stake. What this will do is that it will provide a real world test for proof of stake on Ethereum’s platform. But what does that mean for Ethereum and what are the advantages of this protocol? Let’s take a look. At the same time proof-of-stake makes the implementation of sharding easier. In a proof-of-work system it will be easier for an attacker to attack individual shards which may not have high hashrate. Also, in POS miners won’t be getting a block fee, and they can only earn via transaction fees. 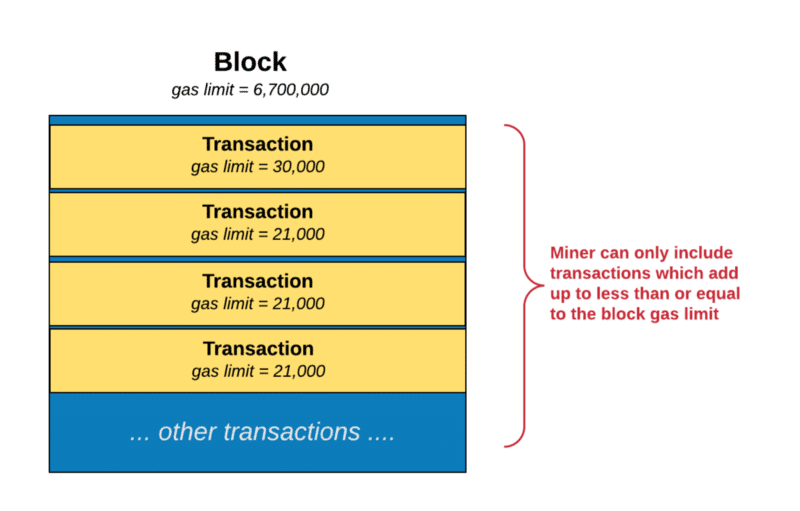 This incentivizes them to increase the block size to get in more transactions (via gas management). What is the future of proof of stake? As of right now, Casper stage one is going to be implemented on the blockchain, wherein every 100th block will be checked via proof-of-stake. Yoichi Hirai from Ethereum foundations has been running casper scripts through mathematical bug detectors to make sure that it is completely bug free. Eventually, the plan is to move majority of the block creation through proof-of-stake and the way they are planning to do that is….by entering the ice age. The “ice age” is a difficulty time bomb which is going to make mining exponentially more difficult. Having an impossibly high difficulty will greatly reduce the hash rate which in turn will reduce the speed of the entire blockchain and the DAPPS running on it. This will force everyone involved in Ethereum to move on to proof-of-stake. However, this entire transition is not without its obstacles. One of the biggest fears that people have is that miners may forced a hardfork in the chain at a point before the ice age begins and then continue mining in that chain. This could be potentially disastrous because that would mean there could be 3 different chains of Ethereum running at the same time: Ethereum classic, Ethereum proof of work and Ethereum proof of stake. This is currently all speculation. For now, the fact is that, for a scalable model, it is critical for Ethereum to use proof of stake to get the speed and the flexibility it requires. The biggest problem that Ethereum is facing is the speed of transaction verification. Each and every full node in the network has to download and save the entire blockchain. 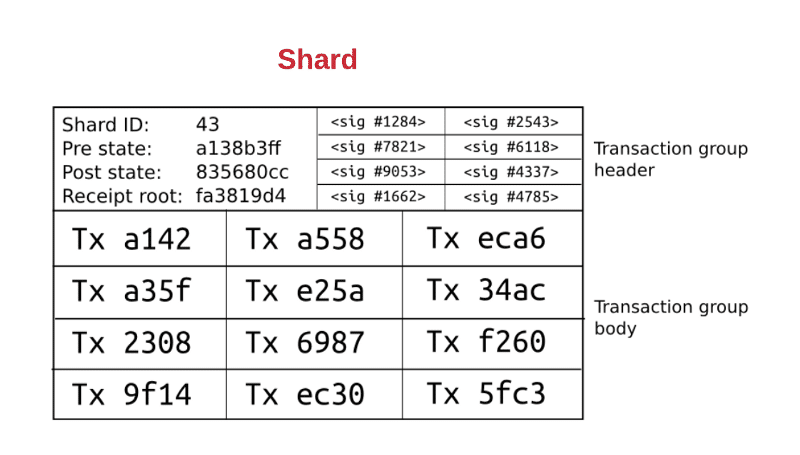 What sharding does is that it breaks down a transaction into shards and spreads it among the network. The nodes work on individual shards side-by-side. This in turn decreases the overall time taken. Did bitcoin really need blocks? Did it really need a block chain?? Satoshi could have simply made a chain of transactions by including the hash of the previous transaction in the newer transaction, making a “transaction chain” so to speak. 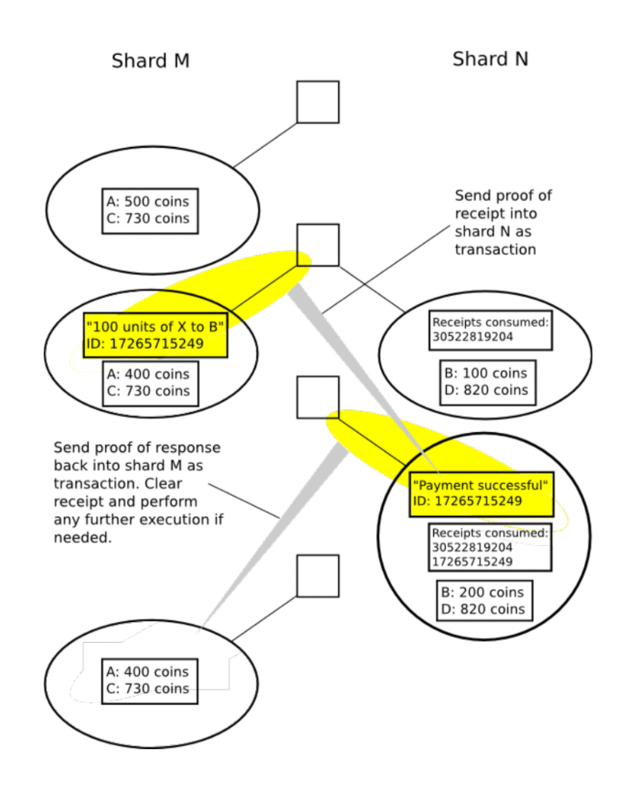 The first level is the transaction group. Each shard has its own group of transaction. Pre state root: This the state of the root of shard 43 before the transactions were applied. No, don’t be scared! It is easier to understand than it looks. Transaction group is valid only if:a) Pre state root matches the shard root in the global state. The shards are basically like islands. So how do these islands communicate with each other? Remember, the purpose of shards is to make lots of parallel transactions happen at the same time to increase performance. If Ethereum allows random cross shard communication, then that defeats the entire purpose of sharding. Proof of stake needs to be implemented first to make sharding easier according to Vlad Zamfir. In a proof-of-work system it will be easier to attack shards with lesser hashrate. What is a state channel? The participants interact with each other by signing transactions among each other without letting submitting anything to the miners. So, in the image above. We have a car which directly interacts with the charger and does a total of $39.19 worth of transactions. Finally, after a series of interactions the entire transaction chunk is added to the blockchain. Imagine how much time it would have taken if they had to run every single transaction through the blockchain! The off-chain state channel that bitcoin is looking to implement is the lightning network. Since the double check relies heavily upon the transaction identifier, if for some reason the identifier is changed, this will cause an error in the system and the Lightning Network will not activate. In case, you are wondering what the transaction identifier is, it is the transaction name aka the hash of the input and output transactions. A bug called “Transaction Malleability” can cause the transaction identifier to change. However, this will not be a problem anymore, because Segwit activation removes this bug. Ethereum is also planning to activate something like the lightning network which is called “Raiden”. 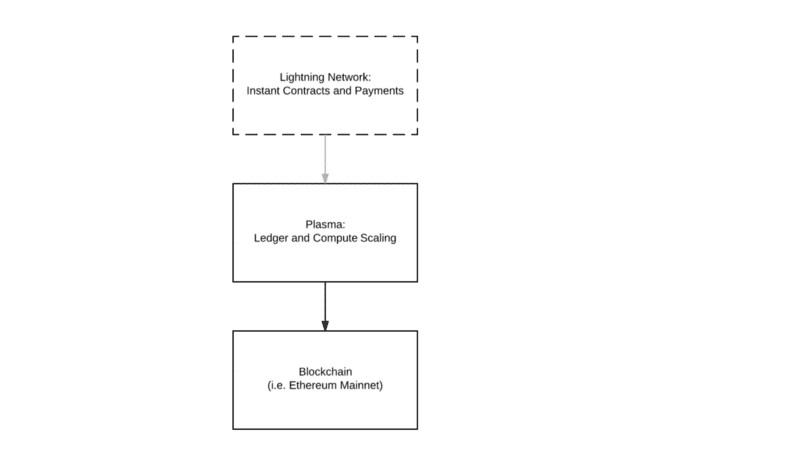 Plasma is a series of contracts that run on top of the root chain (the main Ethereum blockchain). If one were to envision the architecture and the structure, then think of the main blockchain and the plasma blockchains as a tree. The main blockchain is the root while the plasma chain aka child blockchains are the branches. This greatly reduces the load on the main chain. Periodically the branches keep sending reports to the main chain. In fact, you can view the Root Chain as the supreme court and all the branches as the subordinate courts which derives its powers from the main court. All the branch chains can issue their own unique tokens which can incentivize chain-validators to take care of the chains and to ensure that it is fault-free. Each branch has its own independent data and when it does need to submit some data to the main chain, it doesn’t dump all its contents, it just submits the blog header hash to the main chain. Not only does plasma save up a lot of space in the main chain, it also increases the transaction process speed exponentially. If implemented properly, this could be one of the most revolutionary changes ever made to Ethereum and cryptocurrency in general. Cryptocurrency, and especially, bitcoin and ethereum are becoming more and more mainstream. In order to keep pace with the increased usage, they need to seriously step it up when it comes to scalability. Fortunately, there are some fascinating solutions which could give them some very interesting results. Can they truly solve the scalability issue though? That remains to be seen.